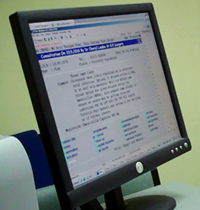 The Ergonomics of Electronic Patient Records is an interdisciplinary research project, which develops methodologies for understanding and exploiting free text to enhance the utility of primary care electronic patient records. The project explores the extent to which information contained within the free text fields of electronic patient records can be unlocked for research purposes. This study is funded by the Wellcome Trust under the Joint Initiative in Electronic Patient Records and Databases in Research Scheme. It is focussed on information in primary care electronic health records and how both coded and free text information are created and used.